3M (NYSE: MMM) is set to report its first quarter earnings on April 24, with expectations for another strong quarter. Robust organic growth across all business groups and all geographic areas helped the company to handily beat consensus estimates on both earnings and revenues in the fourth quarter of 2017. Given the impressive performance last time around, as well as the impact of the tax reform, 3M provided an updated guidance for 2018. 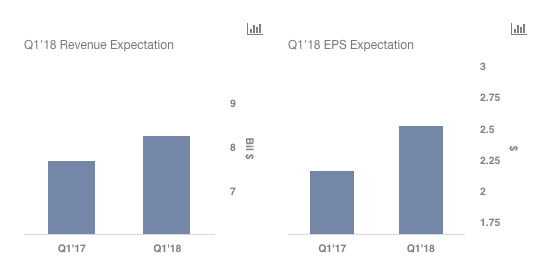 Earnings of $10.20 to $10.70 per share are now anticipated in FY 2018, up from the previous range of $9.60 to $10.00, with the tax rate expected to be 20% to 22%, versus the prior range of 26% to 27%. Organic sales growth forecast, at 3% to 5%, remains the same. We have created an interactive dashboard based on our expectations of 3M’s performance in 2018, and have arrived at a price estimate of $267 for the company, which is higher than the current market price. Recent market volatility has been the main factor driving the stock of the company down, as the core fundamentals remain strong. You can click here to modify the different assumptions, and arrive at your own price estimate for the company. 3M is heavily dependent on the health of the U.S. economy, and the cyclical nature of many of its businesses, such as industrial abrasives and adhesives, safety equipment, and electronics, results in the company’s performance moving along with that of the economy. What will work for 3M in 2018 is that a possibility of a recession looms nowhere on the horizon. Moreover, the recent tax reform should, in fact, boost economic activity. To return to solid growth in the U.S. in 2017, 3M instituted rebate incentive plans with its most loyal and best performing customers, by which they got price breaks. Consequently, all of the organic growth in the country had been a result of volume increases, while price had a -0.3% impact. This trend should reverse in 2018, with the company expecting 30 to 50 basis points of price growth for the U.S.
3M’s Industrials division is its largest sales contributor, and posted organic growth of 3.9% in Q4 and 4.9% for FY 2017. The division benefited from increased demand from automotive, aerospace, and industrial adhesives and tapes customers. The growth was led by a high single-digit increase in Asia-Pacific, followed by mid-single digit growth in both EMEA and Latin America/Canada. Even in the future, the growth in this segment is set to be driven by its presence in the developing markets, particularly China and India. Moreover, industrial production has been on an upswing in recent months in the U.S., which augurs well for 3M. 3M has undertaken a number of portfolio actions in its Safety & Graphics (S&G) division, which posted the highest reported sales growth for the company in Q4 2017. The segment’s revenues increased 15% year-on-year, with growth reported in all businesses, led by personal safety, roofing granules, and transportation safety. Asia-Pacific continues to be the star performer, with sales growth of 18% recorded in the region, followed by 12% in EMEA and 9% in the US. The company enhanced its S&G portfolio with the acquisition of Scott Safety from Johnson Controls during FY 2017. 3M also announced several divestitures in the division, including that of its Identity Management business, its Tolling and Automated License/Number Plate Recognition business, and its Electronic Monitoring Business. 3M has built a good momentum into the business, which should bode well for the future, also.